“Södra Sandby, Sweden” part of “The Eye Is a Door” exhibit at Smith College. NORTHAMPTON — Anne Whiston Spirn wants to be clear about her choice of metaphor. “A window is something to look through,” Spirn has said, “but a doorway is to pass through; crossing a threshold, one enters a new place.” A sense of place deeply informs “The Eye Is a Door: Landscape Photographs by Anne Whiston Spirn.” The show runs through Aug. 31 at the Smith College Museum of Art. Those places range from very near to very far: Nahant, where Spirn lives, Japan, Australia, Iceland, Sweden, Britain, France, the American West. There are 47 color photographs in the show, and at least seven have doorways or entrances in them. Spirn, who teaches landscape architecture and planning at MIT, took the images between 1978 to 2013, yet dates seem irrelevant. All of them suggest a timeless quality. Or, rather, they seem so specifically in the given moment that Spirn took them that they stand outside of time. “Finding the place to stand may be a matter of inches as of years,” she’s written. While never making her colors seem unnatural or hyped, Spirn gets the utmost out of them. So many of her images manage to be simultaneously gorgeous and chaste. There’s a matter-of-fact flawlessness to these photographs. Declining to call attention to itself, that flawlessness is felt more than seen. The blue in “North Head, Sydney, Australia” is such a blue. The subtlety of the interplay between green (vegetation) and red (soil) in “Uluru, Central Desert, Australia” is quite marvelous. 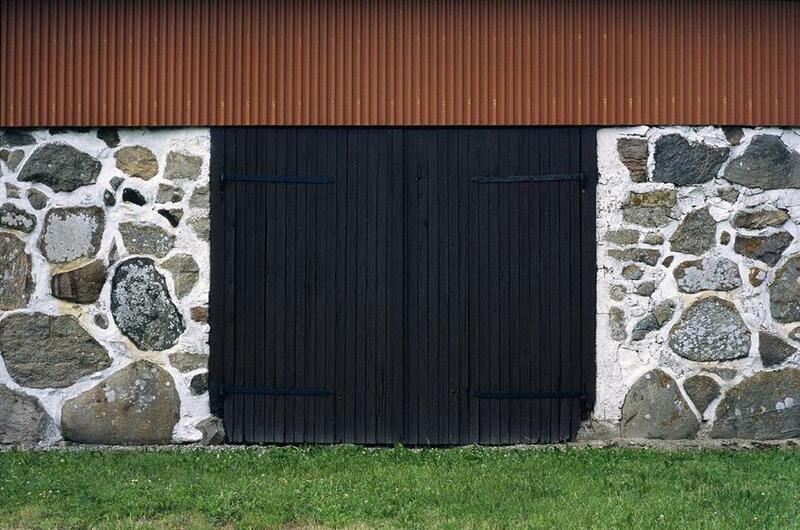 A barn, in “Södra Sandby, Sweden” offers its own transporting interplay of those colors: red eaves above, green grass below, and patterning of stone walls and darkness of doors in between. The effect of scale is nearly as great as that of color. Most of the pictures are 20 inches by 30 inches or 30 inches by 40 inches, with two (relative) behemoths of 50 inches by 40 inches. There’s a sense of space to go with the sense of place. Details don’t get lost. The size of the pictures makes the landscapes feel habitable. There are no people in them, but often evidence of their presence — not just the “acceptable” picturesqueness of white-washed cottages or stone walls, but an aqueduct, a pipeline, telephone poles and wires. Spirn’s vision of the world is inclusive. She’s exacting, but no purist. And just as nature can raise up and ennoble the man-made — isn’t the appeal of a stone wall that it seems like a geological formation being put to use? — so can the man-made enrich the natural, and in unexpected ways. Another picture from Södra Sandby shows several trees seen from beneath. The intricacy of branch, leaf, and tendril in the right half of the image recalls the fecund density of a Pollock canvas. In “Hill of Remembrance, Forest Cemetery, Stockholm, Sweden” the man-made setting appears so intrinsic to the landscape as to feel as much a part of nature as any meadow or knoll. 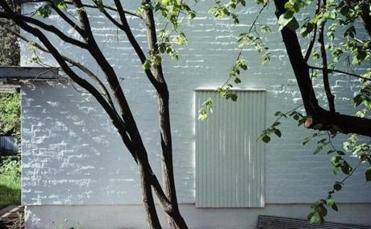 Perhaps the finest expression of this collaboration between nature and artifice is a photograph of the exterior of the architect Alvar Aalto’s studio, with slender tree trunks and branches in the foreground and sun-splashed wall and doorway behind. In this photograph, as in so many of the others, there’s something like exaltation, but not quite. The images are too grounded in specificity for that. They’re too solid. Exaltation is a quality of spirit, and the emotions here are always rooted in place — a particular, there-and-then, on-this-planet place. “Photography is to seeing what poetry is to writing,” Spirn has said. That may or may not be so. What’s certainly the case is that her images honor Ezra Pound’s dictum that “Poetry has to be as well written as prose.” Spirn’s is.